EuroJackpot is a transnational European lottery that was launched in March 2012. The first ticket sales began on 17 March 2012 and the first ever draw happened 23 March 2012. As of October 2014, the countries participating this lottery include Croatia, Czech Republic, Denmark, Estonia, Finland, Germany, Hungary, Iceland, Italy, Latvia, Lithuania, the Netherlands, Norway, Slovenia, Spain and Sweden. Draw happens once a week, every Friday 21:00 CET. 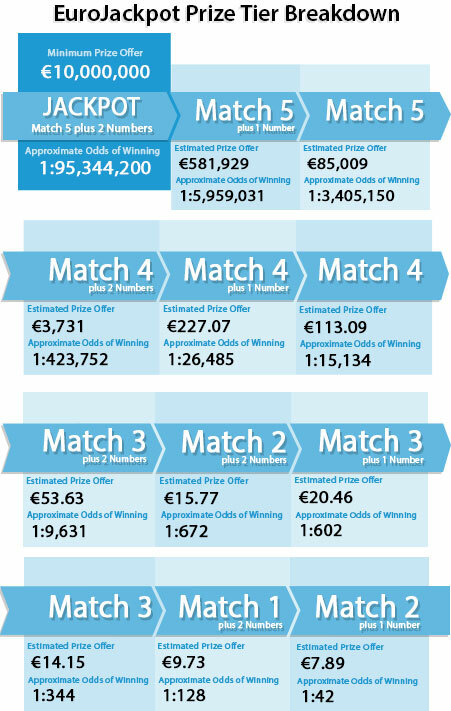 The jackpot starts at €10,000,000 and can roll over up to €90,000,000 until it is won. In comparison with EuroMillions, EuroJackpot has a wider reach of potential players with an audience in local countries of 270 million, compared to the 217 million of EuroMillions. Pick 5 main numbers from selection of 1-50 and 2 additional numbers from 1-10. You can click “Lucky Pick” for auto-generated number combinations. Draw happens once a week - every Friday. Choose the weeks you like to play. Play for the upcoming draw or you can also select to play for multiple future draws. Once you have placed your order with us, you will receive your OneLotto official ticket(s), which can then be viewed within your “My Account“ page. EuroJackpot draws happen in Helsinki, Finland, every Friday, 21:00 GMT. After the official announcement of winning numbers and prize breakdown, OneLotto will publish and upload the results onto our website. Participating players will also receive a full result email. The minimum amount of jackpot prize is €10,000,000 and if no one wins the jackpot, it will rollover until it reaches the maximum amount of €90,000,000. There is 1 in 95,344,200 odd of winning the top prize but overall, the odds of winning a prize is 1 in 42.